Women’s History Month 10th Anniversary Fundraiser – DSV Group Elevates Corp.
DSV Group Elevates Corporation is proud to be a sponsor of this year’s Annual Women’s History Month 10th Year Anniversary Event by Peppy Entertainment & Promotions on Saturday March 28, 2015 from 6:00pm-11:30pm at Sandovan Restaurant & Lounge – 4809 Georgia Ave NW Washington, DC. At this year’s 10th anniversary event, Ms. Peppy will collaborate with other remarkable women including Ange’ Anglade, Nola Mendez-Parks, and other phenomenal women to present this not-to-be-missed event! The event will feature Strykers Posse Reggae Band, Lady Flame, Cecily, Reshada Pullen-Jireh doing LIVE painting, and other invited performers. A Fashion Show with awesome models including Marvett Nelson, Ivel M’sa Felder, and others will be a highlight. Come for the amazing food from Sandovan Restaurant, prizes, surprises, the “10 Women Strong” $5 drink specials, fun, and much more. Please visit the official event page and consider making a donation as a sponsor or attendee by purchasing your tickets for this event at http//www.10womenstrong.eventbrite.com. If you are interested in joining us to empower and make a difference in women’s lives, please contact Danielle at dsvgroupllc@gmail.com or Peppy at peppypromotions@gmail.com for sponsorship opportunities. This is an organized and upscale event featuring phenomenal women of all professions. Tickets are currently only $10 until February 28th and $15 thereafter until the day of the event. ALL are invited to attend! The opportunity to highlight yourself as a strong woman and pay respect to other strong women among you who are doing great community service. 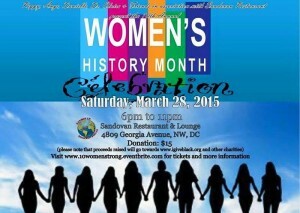 The opportunity to celebrate 10 years of highlighting WOMEN in the DMV. This year’s proceeds from the event will be donated to www.igiveblack.org. Please also consider a donation to DSV Group Elevates Corporation to support our humanitarian efforts!